is not quite the same as arriving. Muscles sore from pulling wheely cases and toting laptops finally come to rest at Heptonstall. I unpack. My office for the next week. My business is writing. That is what the Arvon Foundation provides. 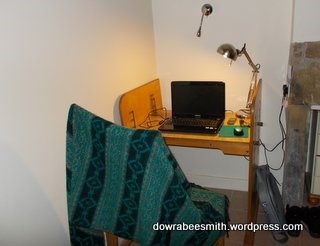 Space for writers. And it is Perfect. Private. Ground floor. Sensitively providing a wetroom for the slightly lame and halt. 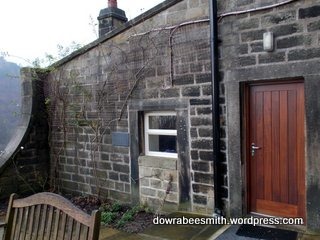 Arvon’s Lumb Bank could not be more astute in providing me with made to order writing space. 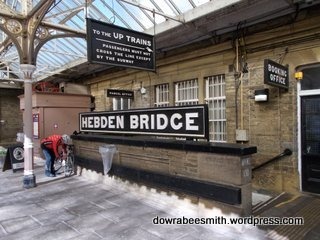 The train pitches up at Hebden Bridge where we disgorge and decant our plethora of baggage before exploring the nearest ‘big town’ to Lumb Bank. Which is a town that seems to be the product of Posy Simmond’s magical thinking. Not only has it a Little Theatre, a Picture House, a Quaker Meeting,enough organic bakeries and cafes to fodder an army of hippies, you can also buy yourself some bamboo or hemp socks and get a recycled cycle. It has buses and trains with posted schedules. Which appear to run on time! It is like a sustainable living model village with Fairtrade written in its stick of candy rock. It feels almost Scandinavian. 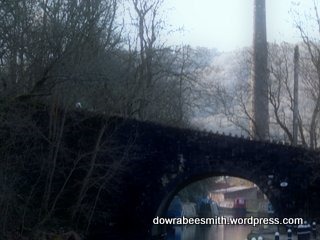 It has the Calder River and the Rochdale Canal. The soot has been blasted off the mellow sandstone facades mostly. 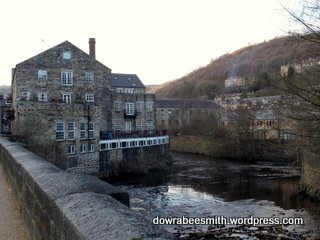 There is some soot about though to authenticate its mill town past. Not only is it certified hippie haven it’s also dedicated to dog comfort. We need caffeine, wifi and lunch. We find a cafe with wifi that also makes muffins for dogs that are gluten, salt and sugar free. There are dog beds scattered around the cafe as well as water bowls and little tether points where you can hook your leash. Various dogs come in with their owners for lunch and both chow down. I eat a puy lentil and butternut squash salad and have the best brownie east of the continental US. Not for dogs since chocolate is toxic for them. So The Lamppost likes two leggeds, too. I have landed in a place designed by English Eccentrics. But it works. I buy a pair of socks. And some incense. I can work this look. I’m definitely not in Ireland anymore. Bee Smith is travelling in March 2014 with the Leonardo da Vinci Life Long Learning Programme “Developing Creative Practice Across Borders” to Yorkshire and Lancashire organised by the Cavan Arts Office.